Kitchen organization can be an ongoing journey. Processes evolve, items rotate, and we make adjustments as we learn better ways of doing things. Just because your kitchen feels like a cluttered mess now doesn't mean it needs to stay that way. We've collected dozens of kitchen organizing ideas and compiled them alongside some smart tips. Tackle a few of your trouble spots, and before you know it, you'll have the momentum needed to organize even the smallest and messiest of kitchens. Continue to 2 of 30 below. One way to ensure that you keep basic dry products organized is by picking canisters you like. Implement a design that will function in an organizational capacity, but also act as decor for your kitchen. Continue to 3 of 30 below. There are many ways you can add style and function to your kitchen. To recreate this look, hang up three circular corkboards on your kitchen backsplash. Next, print off some fun and inspirational printables. Finally, add on important notes and reminders to keep you on task. Continue to 4 of 30 below. Stacking dish towels horizontally might seem like an excellent way to keep them in order, but you'll save yourself a lot digging if you line them up vertically instead. Use a divider to store pot holders and other kitchen linens. A word of warning—there will be a lot of wasted space if the drawer is deeper than a vertically folded dish towel. Continue to 5 of 30 below. Using bold, simple pantry labels is an effective way to keep dry goods organized. Keep the labels consistent and label everything, even the items you don't think require a label. Continue to 6 of 30 below. Under the sink storage can easily go from under control to out of control. To keep things orderly, attach a small basket to the inside of the cabinet door using damage-free picture hanging strips. Store items like dishwasher tabs, sponges, and other everyday objects that you don't want to dig around to find. Continue to 7 of 30 below. The most functional kitchens are the ones where there is a designated place for everything. Does your kitchen have a spot for plastic bags? If not, create this clever and compact storage solution out of an oatmeal container. If any bags don't fit inside the container, be sure to recycle them. Continue to 8 of 30 below. Tea lovers know how easily an entire cabinet can get filled with bulky cardboard tea boxes. Keep your tea, coffee cartridge pods, and other necessities organized inside a drawer instead. Narrow plastic bins will work well to keep your tea in full view. Continue to 9 of 30 below. Utilizing every square inch of space is important in a small kitchen. If you love to cook, but have nowhere to put all your utensils, tackle this DIY project. If this aesthetic doesn't appeal to you, change out the containers to better fit your style. Continue to 10 of 30 below. If you just throw things in the fridge when you get back from the grocery store without much thought, stop right now. Some areas of the fridge work better for certain items. For instance, keep items you use often at eye level. Also, milk and other perishable items should be kept on the lowest shelves that are the coolest. Organizing the fridge is important because once everything has a spot, scanning for items you need will be a much quicker process. Continue to 11 of 30 below. Command centers can get real busy real fast. Keep everything organized and out of sight by stationing the center inside a kitchen cabinet. Use magnetic chalkboard paint to get started. Continue to 12 of 30 below. If you have a blank wall in your kitchen that is serving no purpose, paint it with chalkboard paint. Not only will it serve to keep grocery lists and meal plans organized, but it can also keep young children distracted while you cook. Continue to 13 of 30 below. Some people like to keep their countertops completely bare, but those people are missing out on some great organization opportunities. The key to keeping countertops looking polished and neat is to organize different groupings using trays and stands. Notice how all the coffee items are on one tray, fruit is on another tray, and dry good canisters are on another tray. Continue to 14 of 30 below. Lazy Susans are common kitchen organization tools that are used in a variety of ways. You'll often find them in awkward corner cabinets. To make better use of a Lazy Susan, incorporate some removable bins and organize like items in each bin. This idea will help prevent things from falling over and getting lost when you dig through the cabinet. Continue to 15 of 30 below. It might seem easier to just throw all your container lids inside a drawer and call it a day. Even if you stack them neatly, opening and closing the drawer will eventually cause them to become disorderly. Prevent this mess by sectioning off the inside of your designated drawer and organizing the containers by size. Continue to 16 of 30 below. Leaving things out that you use every day isn't cluttered—it's practical. 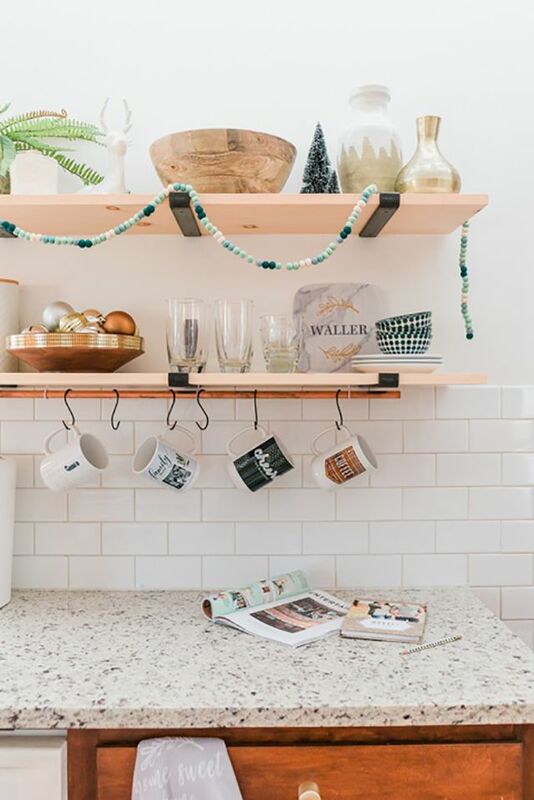 Keep coffee mugs organized and within reach by adding hooks to the bottom of open shelving or kitchen cabinets. Make sure you position this DIY project close to the coffee pot. Continue to 17 of 30 below. There are plenty of items to keep organized by the kitchen sink: brushes, sponges, and dish soap to name a few. Keep all your dish brushes together in a stylish way by incorporating a vintage porcelain container that you can keep next to the sink. Continue to 18 of 30 below. If you like cramming your dishes inside a kitchen cabinet like you're playing a game of Tetris, then maybe this kitchen organizing idea won't appeal to you. However, mugs can get broken if they are stacked too high. Not only that, but it's a pain to pull out plates that are stacked underneath a ton of bowls. To fix this problem, use inexpensive cabinet risers to create an extra shelf. Continue to 19 of 30 below. Many paper towel holders sit directly on the countertop. If you have the space underneath kitchen cabinets or open shelving, hang paper towels there instead. Don't worry if you can't find a holder that matches your decor. It's easy enough to make your own. Continue to 20 of 30 below. If your spices need a place to go, there are hundreds of spice rack options on the market. If you are lacking space and want to build something, consider making a custom spice rack. Utilize the space by the stove, at the end of a cabinet, or inside a drawer. Continue to 21 of 30 below. Don't forget to utilize the back of any door inside your kitchen, whether that's a cabinet door or a pantry door. There are specially designed door racks that are made for the back of pantry doors and linen closet doors. Use this area to store food that you eat and restock often. Continue to 22 of 30 below. When a kitchen is lacking a pantry, storage and organizing become much trickier. To make up for the lost space, many homeowners have opted for freestanding pantry storage. Think about different pieces of furniture you could repurpose for the task. This blogger uses Ikea storage lockers, but you could also use an antique armoire or a bookshelf. Continue to 23 of 30 below. Any organizer that has vertical slats will work to keep your baking pans accessible inside a kitchen cabinet. Some people have repurposed mail organizers and others have bought specific tools for the job from home improvement stores. Continue to 24 of 30 below. Sometimes it doesn't make sense to keep a coffee pot on the counter, and that's okay. If you entertain a lot, it might be more practical to store all your coffee-related items on a rolling cart. That way, you can roll the cart to where the guests are and return it to the kitchen when you're done. Continue to 25 of 30 below. File holders and magazine organizers are the perfect desk accessory to use for kitchen organizing. If you plan on storing produce, opt for wire holders that have a lot of openings for air circulation. Continue to 26 of 30 below. Tiered trays work well for storing items in your kitchen that you use every day. Depending on your household, what you store in a tiered tray could vary greatly. If you have young kids, perhaps you keep out some healthy snacks within their reach. In this case, the tiered tray is filled with tea-related items. Continue to 27 of 30 below. There are pros and cons to having open shelving in a kitchen. One of the biggest cons people complain about is dust build up. To avoid this problem, organize open shelving with items you use and wash often. Dishes that are in an everyday rotation will be cleaned and put away so regularly that they won't need to be dusted. You'll also pay much more attention to cleaning the shelf than if you had just decor on it. Continue to 28 of 30 below. Many people have started hanging measuring cups and spoons on the inside of a cabinet door. One way to enhance this organizational trick is to add common measuring conversion graphics to the door. This way it looks cuter and you won't always need to pull out your phone and ask Google for correct measurements. Continue to 29 of 30 below. Most kitchens designate a drawer for silverware and go out and buy the appropriate silverware organizer. However, when it comes to utensil drawers, spoons and whisks are often thrown in with no regard for organization. This lack of forethought could be due to how many different varieties and sizes of kitchen utensils we stock. To fix this issue, think about a few different utensil categories and separate a drawer with dividers. Once complete, you'll have a much easier time finding what you need in the middle of cooking. Continue to 30 of 30 below. If you want to cook like a chef, keep a tray or basket next to the stove that will hold your most used cooking items. Pragmatically, this is an ideal way to cook because you won't have to take more than two steps to grab all the necessary tools. Some items to have on hand might include olive oil, salt and pepper, vinegar, and common cooking utensils.